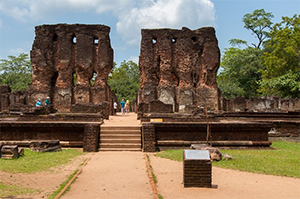 One of the highlights of the Cultural Triangle, if not the whole of Sri Lanka, is the great ruined capital of Polonnaruwa is. 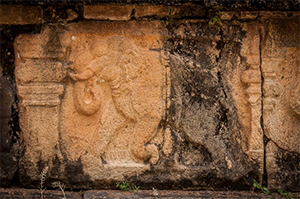 In its twelfth-century heyday the city represented a high point of early Sri Lanka civilisation. 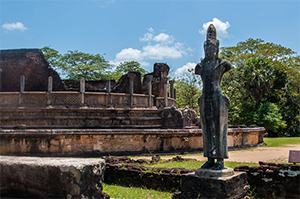 Polonnaruwa has extensive and well-preserved structures that offer a fascinating glimpse of the Sri Lanka of the middle ages, including some of the island’s finest monuments. It is compact enough to be looked over fairly completely in a single (but busy) day. Royal Palace The first group of ruins you meet after entering the ground of the Ancient City is the Royal Palace Group. 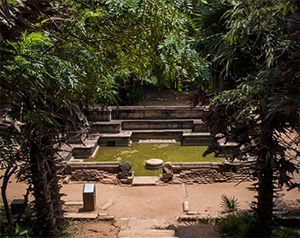 This group of buildings dates from the period of King Parakramabahu I (1153 – 1186). The King`s Royal Palace is a massive structure, measuring 31 m by 13 m, once including 50 rooms supported by 30 columns. Even today it is quite an impressive building, but picture it being seven floors tall with 3m thick walls, as the archaeologists claim it once was!